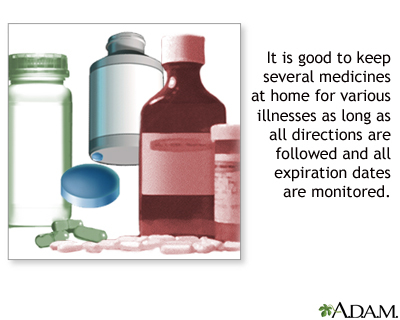 You can buy many medicines for minor problems at the store without a prescription (over-the-counter). Always follow the printed directions and warnings. Talk to your health care provider before starting a new medicine. Know what you are taking. Look at the list of ingredients and choose products that have fewer items listed. All medicines become less effective over time and should be replaced. Check the expiration date before using any product. Women who are pregnant or breastfeeding should talk to their provider before taking any new medicine. Medicines affect children and older adults differently. People in these age groups should take special care when taking over-the-counter medicines. Your symptoms are very bad. You are not sure what is wrong with you. You have a long-term medical problem or you are taking prescription medicines. Over-the-counter pain medicines can help with headache, arthritis pain, sprains, and other minor joint and muscle problems. Acetaminophen -- Try this medicine first for your pain. DO NOT take more than 3 grams (3,000 mg) on any one day. Large amounts can harm your liver. Remember that 3 grams is about the same as 6 extra-strength pills or 9 regular pills. Nonsteroidal anti-inflammatory drugs (NSAIDs) -- You can buy some NSAIDs, such as ibuprofen and naproxen, without a prescription. Both of these medicines can have serious side effects if you take them in high doses or for a long time. Tell your provider if you are taking these medicines many times a week. You may need to be checked for side effects. Acetaminophen (Tylenol) and ibuprofen (Advil, Motrin) help reduce fever in children and adults. Take ibuprofen every 6 to 8 hours. DO NOT use ibuprofen in children younger than 6 months. Know how much you or your child weighs before giving these medicines. Aspirin works very well for treating fever in adults. DO NOT give aspirin to a child unless your child's provider tells you it is OK. Cold medicines can treat symptoms to make you feel better, but they do not shorten a cold. Taking zinc supplements within 24 hours of the start of a cold may reduce the symptoms and duration of a cold. NOTE: Talk to your provider before giving your child any type of over-the-counter cold medicine, even if it is labeled for children. Guaifenesin -- Helps break up mucus. Drink lots of fluids if you take this medicine. Menthol throat lozenges -- Soothe "tickle" in the throat (Halls, Robitussin, and Vicks). Liquid cough medicines with dextromethorphan -- Suppress the urge to cough (Benylin, Delsym, Robitussin DM, Simply Cough, Vicks 44, and store brands). Decongestants help clear a runny nose and relieve postnasal drip. Decongestant nasal sprays may work more quickly, but they can have a rebound effect if you use them for more than 3 to 5 days. Your symptoms may get worse if you keep using these sprays. Check with your provider before taking decongestants if you have high blood pressure or prostate problems. Oral decongestants: Pseudoephedrine (Contac Non-Drowsy, Sudafed, and store brands); phenylephrine (Sudafed PE and store brands). Decongestant nasal sprays: Oxymetazoline (Afrin, Neo-Synephrine Nighttime, Sinex Spray); phenylephrine (Neo-Synephrine, Sinex Capsules). Sprays to numb pain -- Dyclonine (Cepacol); phenol (Chloraseptic). Painkillers -- Acetaminophen (Tylenol), ibuprofen (Advil, Motrin), naproxen (Aleve). Hard candies that coat throat -- Sucking on candy or throat lozenges can be soothing. Be careful in young children because of the choking risk. Antihistamine pills and liquids work well for treating allergy symptoms. Talk to your provider before giving medicines that cause sleepiness to a child, because they can affect learning. They can also affect alertness in adults. Antidiarrhea medicines such as loperamide (Imodium) -- These medicines slow down action of intestine and reduce number of bowel movements. Talk to your provider before taking them because they can worsen diarrhea caused by infection. Medicines that contain bismuth -- May be taken for mild diarrhea (Kaopectate, Pepto-Bismol). Rehydration fluids -- May be used for moderate and severe diarrhea (Analytes or Pedialyte).